Now you are going to cook a recipe that is prepared in many countries around the world . Where each country is in charge of giving it their special touch and Mexico is not the exception – therefore we are going to prepare a “Mexican picadillo". The picadillo in Mexico is prepared with ground beef, which is mixed with vegetables and it is cooked in a kind of red salsa. You will love this combination of flavors and ingredients. 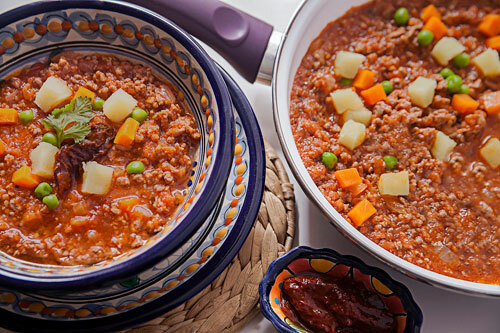 The great advantage of this picadillo is that it can be used in any occasion. It can be served as entree dish with tortillas or tostadas , it can also be served as main course and accompanied with red rice and refried beans or you can serve it over a white rice bed. Although if a great occasion arises, garnish it with almonds and dried fruits; and you already have a filling for some traditional and elegant chiles en nogada. The picadillo preparation is a bit laborious, there are many steps to follow but all of them are very easy to perform. In this recipe peas are used, which can be bought canned or frozen. Chipotle pepper in adobo is also used, which can be bought canned or you can prepare it with us. The total preparation time is of 25 minutes . The recipe serves 4 plates. Finely chop 1/4 of an onion (1.2 oz), then reserve. Peel 1 potato and 1 carrot. Dice the potato and the carrot that were peeled; then set aside. 1 Chipotle Pepper in Adobo. Put in the saucepan the onion that was minced and fry it for approximately 1 minute, until it looks a bit transparent; stir regularly. Incorporate in the saucepan 12.3 oz of ground beef and fry it for about 4 minutes, until it is lightly cooked and it has a light brown color; stir regularly. The Salsa that was blended. The Potato and Carrot dices that were chopped. Don’t put too much cumin to the picadillo because its flavor can turn bitter. When the salsa boils reduce to low heat and cook the beef picadillo for about 15 minutes, until the beef is well cooked and the salsa has almost totally consumed; stir occasionally. When the cooking is done discard the 2 bay leaves. Suggestion: Heat some tortillas , make picadillo tacos and accompany them with some pickled chilies and vegetables. You will love this way of eating picadillo. Variation: Would you like to taste the picadillo with pork meat ? Did you like the Beef Picadillo? ✤ Mexican Food with Maize. The flavor of this ground beef is very good and its freshness excellent. We definitely recommend this beef for preparing your picadillo. The “Simply Organic Cumin" is very well ground, it has a penetrating flavor, its aroma is exquisite and the best is that it is organic. The bay leaves are also used in this recipe and there is no better option than the “Simply Organic Bay Leaves". The advantage of these leaves is that they are organic, they come whole, its green dark color is divine and the flavor that they give to the food is delicious.